In a March 2017 General Assembly decision that became effective with this 2018 election cycle, District Court judges will stand for election or re-election in partisan contests. Mecklenburg judges, who previously were elected in a single district identical to the Mecklenburg County line, must now stand for election in one of eight geographic districts. In the material below, this site will refer to “sitting judges” rather than “incumbents” for that reason. The legislation created the districts shown above. All are shown on the same scale. 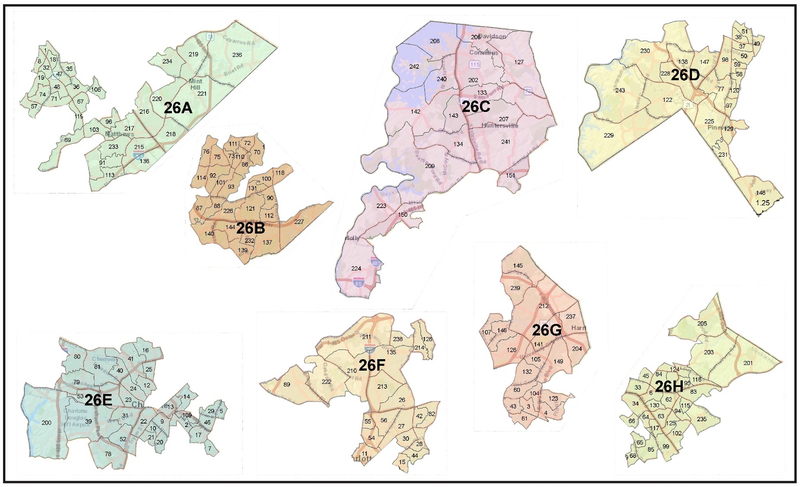 All have roughly the same number of voters; densely populated areas of the county therefore create smaller districts. Collected on pages linked here will be more information about the districts and the judicial candidates running in them. Follow the links underlining words for more information. And please e-mail us if you find errors. – Not all judges serving in Mecklenburg will be on the ballot this year. – Only judges elected in the district that includes your precinct will be on your ballot. Your neighbors a few streets over may vote for different judges if they vote at a different precinct. – For District Court, some districts will elect two judges; some will elect three. But the top two or three vote-getters may not be the ones donning robes. Candidates file for Seat 1 or Seat 2 or Seat 3. For many seats, the sitting judge is unopposed for re-election – or for election, if appointed earlier to fill an unexpired term. One open Superior Court seat drew three candidates. The other three Superior Court seats and nine District Court seats on the ballot this year drew only one or two candidates. Finally, voters in District 26 D in southwest Mecklenburg will not see any local judicial elections on their ballot this year. In addition, unopposed candidates mean there are effectively no local judge decisions for voters to make in Districts 26E, 26G, and 26H. So in four of the eight districts, there are no local judge choices to be decided. To learn which judges you will have a vote on, the first step is to find the judicial district for the precinct at which you vote. The Board of Elections operates a look-up tool here. If you lived where the Forum meets, for example, you would vote in Precinct 14 at Hawthorne Academy, and see Judicial District 26E candidates on your ballot. 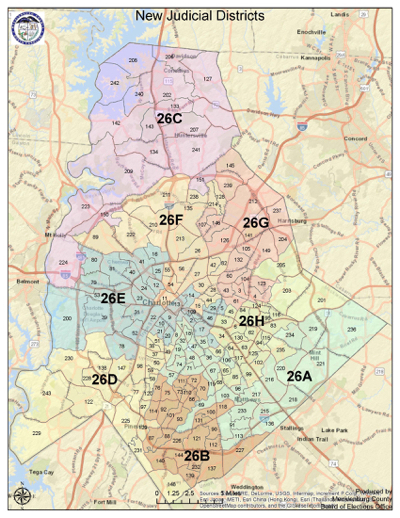 To find out who is a candidate in District 26E, keep reading. From time to time, judicial candidates speak at the Forum. Candidates and their supporters also announce campaign events. And along the way, other material about the candidates will be published elsewhere. All of that material will be linked to the appropriate candidate page. But there are six Superior Court candidates and 13 District Court candidates and you may be voting for just one – or none! Where to begin? Click on district links for additional information on the district and the candidates. There are no Superior Court races. In District Court Seat 1, sitting judge Democrat Alicia D. Brooks faces Republican Michael J. Stading. For Seat 2, sitting judge Donald Cureton Jr., a Democrat, faces Republican Paulina N. Havelka. For District 3, sitting judge Sean Smith, a Republican, faces Democrat Sabrina Blain. There are no Superior Court elections. For District Court Seat 1, sitting judge Matt Osman, a Republican, is unopposed. Superior Court Seat 1 is listed as a new seat and there is no sitting judge running. Candidates are George Bell, a Republican; Howard L. Clark III, a Democrat; and Reggie E. McKnight, a Democrat. There are no Superior Court or District Court seats on the ballot. For Superior Court Seat 1, sitting judge Donnie Hoover, a Democrat, is unopposed. For District Court Seat 1, sitting judge Paige McThenia, a Democrat, is unopposed. For District Court Seat 2, Regan A. Miller, a Democrat, is unopposed. For Superior Court Seat 1, sitting judge Karen Eady-Williams, a Democrat, is unopposed. For District Court Seat 1, sitting judge Tracy Hannah Hewett, a Democrat, is unopposed. For District Court Seat 2, candidates are Karen D. McCallum, a Democrat, and Khalif Rhodes, a Democrat. There are no Superior Court seats on the ballot. For District Court Seat 1, sitting judge Rickye McKoy-Mitchell, a Democrat, is unopposed. For Superior Court Seat 1, sitting District Court Judge Lou Trosch, a Democrat, is unopposed. There are no District Court seats up for election. As candidate pages are created for material on this site, links will be added to the names below.